Part 1: 12,000-Year-Old Gobekli Tepe – Is It Linked to the Star Deneb in the Cygnus Constellation? 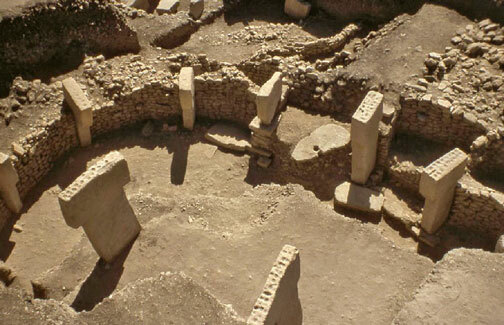 12,000-year-old circles of limestone pillars each weighing from 10 to 20 metric tons or more have been excavated in Gobekli Tepe, Turkey, about 9 miles (15 km) northeast of Sanliurfa, formerly known as Urfa or Edessa. More than twice the age of Mesopotamia, 40 standing T-shaped columns have so far been revealed in four circles between 30 feet and 98 feet (10 to 30 meters) in diameter. Ground-penetrating radar indicates there are still 250 more pillars buried in 16 circles extending over another 22 acres of the 30-acre Neolithic site. Image © 2008 by Haldun Aydingun. Previous PostPrevious Part 2: 12,000-Year-Old Gobekli Tepe – Was It A Soul Recycling Machine Linked to Deneb in the Cygnus Constellation?